Welcome to the Back Bay Scratchers' official website... almost. Check back soon for a full site. In the meantime, enjoy some basics! "Fresh Pressed" - Buy it now! In Yellowknife at Down to Earth Gallery, Gallery of the Midnight Sun, and soon at other stores (stay tuned). Also in Yellowknife - all band members will sell you a copy or three. You can also send cheque/money to the band, and we'll mail you the album. COMING SOON! Buy the digital version on iTunes and at other online retailers. We have a music video?! The Backbay Scratchers / October - Jeromy Deleff & Samantha Hefford from Western Arctic Moving Pictures on Vimeo. 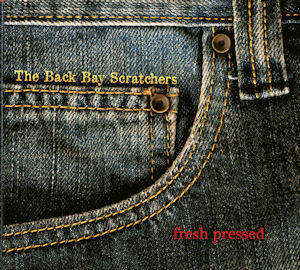 Like so many northern bands, the Back Bay Scratchers were born one cold night in a shack down in Yellowknife's Woodyard. They mix bluegrass, old time, swing, celtic, and hints of country to create a fresh folk sound. Interesting instrumentation and memorable melodies draw audiences and fans into their toe-tapping tunes. Miranda Currie begged her parents for the opportunity to play violin at age seven, and discovered fiddle music at sixteen. She later studied violin and voice at university, where she also discovered her love of songwriting. Claire Marchildon began playing Suzuki violin at the age of four. It wasn't until university that she developed her love of the fiddle, playing at a local coffee house. Ryan McCord played piano and recorder from a young age into his early teens. In his mid-twenties, he rediscovered his love of music after picking up a guitar once again. He's perhaps most famous for his rad Strad kazoo. Ben Russo grew up with music. He received his first guitar when he was in his early teens. Since then, Ben has been busting out wierd and wonderful chords on the guitar and mandolin. Copyright (C) 2012 The Back Bay Scratchers. All Rights Reserved.